We believe that the Lord has placed us here at Crich Baptist Church, to worship Him first of all, and then to serve Him in the proclamation of the gospel. Our immediate part of ‘All the world…..’ is where we live. So week-by-week, our Ministries will find us doing some, or all of the things this section tells you about. We would like to do more, much more, and as the Lord enables we will. Visitors are always welcome, and we always have a more informal fellowship after our Services, with refreshments provided. This is a day that the Lord Himself has set apart, and we seek to honour Him in it. Our two services, at 10.45am and 6.00pm, have at their heart the desire to worship and honour Almighty God. Preaching occupies a high place in our services, indeed we believe it is God’s divinely appointed means of proclaiming the gospel, and of expounding the scriptures. Our pastor will often preach a series of sermons consecutively from one book of the Bible. A different series in the morning, and another one in the evening. From time-to-time he will also speak on a topical issue. Gospel passages are sought out, and expounded from the Old and New Testaments. Indeed Christ can be seen from Genesis to Revelation. Our Sunday School welcomes all children, but most are of pre-school, primary and junior ages. The children learn the message of the Bible in a friendly, caring and responsible environment. We aim to make the lessons lively and interesting with visual aids and related crafts. We also welcome all the family to our Morning Service which begins at 10.45am and includes a talk for the children. The children stay in the main service for about 25 minutes or so, before they leave for Sunday school which begins at approximately 11.10am in the Schoolroom at the back of the church. Prayer is vital in the life and ministry of our church. Our weekly meeting for prayer is held on Tuesday’s, at 7.45pm. This meeting is held in the Schoolroom, as most of our mid-week meetings are. God is thanked for His great goodness to us. The needs of the fellowship, our ministry, prayer for other churches and their needs, concerns for our own nation, and God’s people around the world, including the suffering church, occupy much of our prayer-time. Every Thursday evening in term-time our ‘Seekers Club’ for young people meets at the church. Partly because of numbers, we now have two meetings, one beginning at 5.00pm for those of primary age, the other at 6.00pm for the juniors. It is an opportunity for both groups to learn about the Bible and its message. Each week there is a Bible lesson, followed by an activity to help the young people remember what they have been taught. Besides the time given to the serious teaching of the Bible, there are also plenty of games, crafts and competitions as well as a refreshment break. Thursday is a busy day in our church week, as we gather together again in the evening at 7.45pm for more in-depth Bible study. Our pastor will again take a series of messages, expounding a passage from a particular book of the Bible. The pastor will occasionally intersperse these studies with a consideration of subjects of topical interest. As part of our local evangelism, we engage in door-to-door visitation. We have tried to cover all the village, and when all have been visited, we start again. The people doing this work are not always given a good reception, but in fairness most receive us courteously, and even if they are not interested in the gospel challenge which is presented, they will accept the literature we leave with them. We have however had a number of very profitable conversations ‘on the doors’, so do pray for us in this work. At special times of the year we will also visit each home, leaving gospel literature and giving a special invitation to our church services. 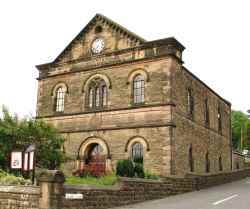 For a little while now we have taken to going to nearby Belper, which is about 5 miles away from Crich and doing some open air evangelism there. This takes place during the late Spring and Summer months, on a Saturday morning.Also, you will occasionally find a group of us outside the church, here in the centre of Crich, preaching the Gospel. Saturday morning is usually very busy, both in Crich and in Belper and each place is full of people doing their shopping. In the summer months these numbers are swelled by holiday makers visiting the area. Sometimes people will stop to listen to what is said. In Crich those in parked cars will occasionally wind their their car windows down to hear better what we are saying. We are mostly received in a friendly fashion, but there have been just a few who have objected to the Christian message and told us so in quite strong terms! In both places, as well as those men from the church who speak, we have other folk from the church positioned around the area where we are, engaging people in conversation about their response to the Gospel of Jesus Christ. They will also hand literature out to those who will accept it. Being a village community we have opportunity through our pastor to help local schools. He is invited to take assemblies, and is often being asked to take part in a number of other school activities. We try to foster a good relationship by making our building available to the local Junior School should they have need to use our facilities. This has been very beneficial, with increasing numbers of the children also coming to our Seekers Clubs. Once each month the pastor is invited to visit the local Senior Citizens group, he and his wife go along. He is able to give a short gospel address, and with the help of his wife playing the piano the old folk are able to enjoy singing hymns familiar to them. We used to have a large Church Bookstall, but, unfortunately this has had to be greatly reduced and sited less conveniently due to quite strict fire-regulations. We do however still have a selection of smaller Christian books available, as well as larger lending library. All the sermons, Sunday morning children’s talks and our weekly Bible studies are recorded. Many of them are made available to a world-wide congregation on the Internet, through the wonderful service provided by www.sermonaudio.com. As well as the .mp3 audio sermons we now offer the Lord’s Day sermons on video. These these are also via www.sermonaudio.com.